The 1956 flood disaster affected many communities and townships along the Murray River with businesses and homes lost forever and Mannum was no exception. Although residents knew floodwaters were coming, no-one predicted the flood levels experienced. 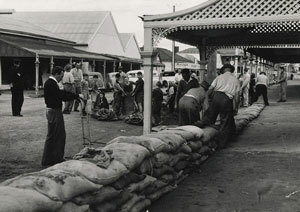 100,000 sandbags were required for riverbanks in the Mannum area and emergency accommodation was provided in E&WS buildings at the show ground. By mid July the river had risen notably with the punt expected to operate for one more week only. Floodwaters in Mannum's main street engulfed the lower green of the Mannum Bowing Club on August 3, with all greens covered the following week. The river rose two inches per day with the August 16 level of 120 feet eight inches expected to rise to 122 feet. The river was two feet six inches above the 1931 level of 3.5m. Mannum Flood emergency kitchen ladies served over 1700 meals to flood volunteers in the town from the rear of the Commercial Bank and on Wednesday August 22 windy conditions resulted in the river level of 122.3 feet placing huge pressure on the bank protecting the lower section of the business area. Sandbagging, some six feet thick and within three feet of the top of the verandah posts in front of the Mannum Hotel held back seven feet of water. The river continued to rise at a frightening rate of more than two inches per day and more than 700 volunteers assisted. Mixed feelings were felt in the town concerning the influx of hundred of tourists. It was felt visitors would trouble flood workers but would bring money to the town. Two local organisations however took advantage of the visitors. The CWA sold afternoon teas and the Mannum Hospital Committee produced souvenirs of the flood. Part of Randell Street was cordoned off with the punt ceasing to operate on July 18. A 27 foot boat owned by D Matulich was then operated by punt lessee R Bock. This craft ran seven trips a day Monday to Thursday with two extra trips on Fridays, three on Saturdays and two on Sundays. On Sunday August 26 the Governor Sir Robert George took a short trip on the Loyalty and mingled with workers over afternoon tea.The same day volunteers plugged the breaches in the bank. The use of several pumps plus two fire brigade units temporarily lowered the water level behind the bank. This enabled valuable equipment to be removed from the bakery and flour mill. On Wednesday September 5 with the river rise scarcely perceptible, it was believed the flood peak was at hand and the worst threat to the town businesses was over. The main road from Mannum to Murray Bridge was out of commission and traffic to Walker Flat and Purnong went via Punthari. The Mannum Council declared the sandbagged section of Randell Street 'out of bounds' to the public and this forced the closure of motion picture screenings in the institute. 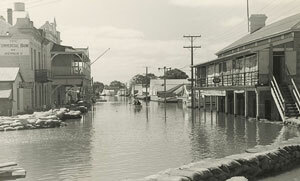 Floodwater in Mannum peaked on the 9th September 1956 at 5.35m. 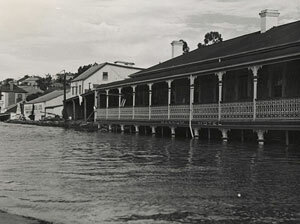 Rowers could be seen rowing down the main street of Mannum and hotels continued to serve through their second storey balconies. It took months and months for the clean up and the ferry did not recommence operating until the 4th of February 1957. Palmer resident, Eric Anderson commented that it was breathtaking and absolutely spectacular. His most memorable memory was when he saw a complete shack flow past him down the river. At one moment the bottom-half was up and the next the roof was up and the house tumbling down the river would be the most outstanding memory of mine. During the peak of the flood Mr Anderson also saw a large gum tree float past with a fox on it and a fridge float past. On September 15, gale force south winds created havoc with waves four to five feet in height causing considerable damage. One shack broke free and was tethered to a tree further down the river. A total of 37 homes were evacuated in Mannum and 25 businesses flooded. Overall more than 80 homes and 37 businesses were directly affected. On September 21 it was reported that the river had dropped seven inches in the past week; with the level now at 124.1 feet it seemed that the immediate flood crises were past. The massive clean up of Randell Street began on November 30 when the river dropped to 119 feet. On January 11th it was published that Mannum's main street was free of floodwaters for the first time in four months. The stench from the mud was reported as overwhelming and the silt from the flood waters and sand from sandbags was reused to fill the reclaimed land presently known as the Arnold Car Park and Mannum Caravan Park. Although the river has experienced high waters in subsequent years; with 3.1m in 1974 and 1.9m in 1993, it is doubtful Mannum will ever see a flood as dramatic as 1956 again. The Mannum Dock Museum has captured the impacts of the 1956 flood through their interesting pictorial and audio visual display now on show. 1956 floods, 50 years on : an insight into how the flood affected the Murraylands (2006) Murray Bridge, SA: Murray Valley Standard.